We spoke with numerous Virtual Reality Arcade owners from around the world to gain insight about the struggles and successes of starting a VR Arcade. 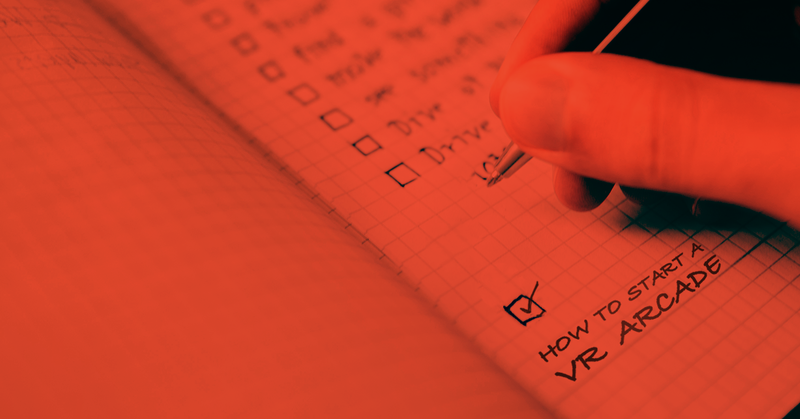 Based on our conversations, we developed a checklist for how to start a VR Arcade from the ground up. From your VR Arcade’s logo, to your arcade game library, to station cable management––here’s everything you need to know to get started. From your VR Arcade’s name to the games your customers will soon play––clarity is the ultimate key. What will your VR Arcade’s core values be? What will make your VR Arcade unique & distinguishable? Defining your Vision & Purpose with clarity provides the cornerstone for all operations involving your VR Arcade. Decide where to plant your flag. Choosing the location for your VR Arcade can be tricky. Luckily, we’ve broken it down into two types of locations, laying out pro’s and con’s for each. Crafting your VR Arcade’s personality is an exciting task, and one that is not to be taken lightly. Building upon your Vision & Purpose from Step 1, it’s time to create the visual representation of your VR Arcade. Whether it be a simple wordmark or stand-alone icon, your logo is what your returning and potential customers will remember and recall. Your website acts as your VR Arcade’s 24/7 employee and advocate. An effective VR Arcade website is one that communicates clearly, coincides with the brand identity, and offers a central hub for potential customers. Social media offers numerous outlets and opportunities for information and communication concerning your arcade. From building anticipation to your grand opening, to announcing promotions and new additions to your game library, social media is where your customers are. Tip: Your VR Arcade’s Brand Identity should remain consistent across all mediums and platforms. Your VR Arcade signage, social media posts, and marketing materials are among a few of the branded items to consider when starting a VR Arcade. Those ducks aren’t going to get themselves in a row. Focused preparation, steadfast organization, and legal compliance will allow your VR Arcade to operate at its fullest potential. Time to cross those t’s and dot those i’s. Now that you’ve nailed down the why, the location, the look, and the legal it’s time to start building out your VR Arcade. What communication channels will connect best with your customers? What kind of content will be most effective in your marketing efforts? How often will you post to social media? Are there any publications or local news programs that would be interested in featuring your VR Arcade? Marketing creates awareness. Awareness produces intrigue. Intrigue turns interested customers into returning visitors. Ready, set, grow! Smaller stations attract solo individuals who are experienced in computer, console, and/or virtual reality gaming. Larger stations, specifically stations that provide additional seating for guest-viewing, attract friends, families, and small groups. Tip: If your budget and timeline allows, create a mock station away from your VR Arcade location. Building a mock station allows for trial and error, which provides invaluable insight into the level of immersion that your customers will experience when they step into your VR Arcade. We recommend a dedicated, high speed broadband connection for your arcade. VR games are big and you don’t want to be waiting hours to download an update. Avoid WiFi if you can, it interferes with the Vive’s own communications. If you do need to use WiFi, try to use 5Ghz instead of 2.4Ghz as the Vive uses 2.4Ghz. For low latency and high reliability, wired is the best option. Tip: There may be students from a nearby university who would like to get some experience (and some dollar!) from advising and helping set this up. Arcade networks don’t have to be complex, even a first year student should have the knowledge necessary to do this. Who knows, they could even be your next employee! Not a topic to be swept under the rug. The more walls and areas you have available to maintain cables, the safer and better off your VR Arcade will be. Having the ability to create a mock station, referred to in Step 6, additionally allows for insight into how your VR Arcade will handle cable management. Tip: Creating dedicated and obvious spaces for each station’s equipment will save significant amounts of time. Having dedicated spaces for equipment that is in-between use enhances the customer experience by eliminating confusion. Nothing is more sad than seeing a HTC headset on the ground. Clear eyes, full headsets, can’t lose. Hire advocates, not zombies. Your employees have the potential to make or break your VR Arcade’s overall experience. Hiring individuals that connect and relate with your core values will only strengthen your customers’ experience. Find good people. Pay them well. Make sure they have the tools they need to succeed and measurable goals to work towards. Don’t be cheap when it comes to people. Note: Not all heroes wear capes. Whether your employees do is up to you! A healthy and successful VR Arcade is one that runs seamlessly, while continuously optimizing and enhancing their customer experience. Optimization is achieved by asking your customers (and staff) for feedback. What did they like most about their arcade experience? What would they add, remove, or change? Believe it or not, the monotonous daily operating tasks of a VR Arcade can be the difference in providing immersive and engaging customer experiences. The springboardVR arcade management software provides increased automation and optimization for VR Arcades. From assigning station time, to accepting payments, to our custom launch environment, springboardVR takes your VR Arcade to the next level––but even more––creates and sustains a fully immersive customer experience. Follow this link to receive the checklist! SpringboardVR makes the best VR content available to everyone, everywhere. Currently 500+ locations in 40+ countries.